sun-soaker collage, originally uploaded by bbmarie. 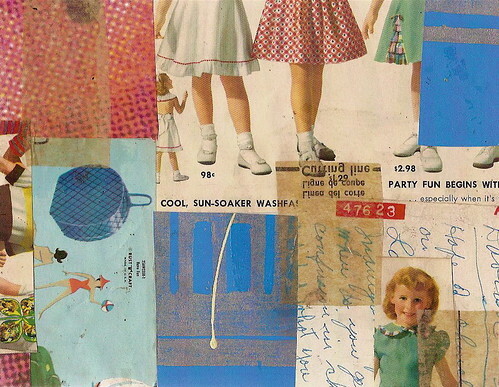 I have been having fun making collages out of old papers I have collected. It is a nice change up from my paintings that can often take months and even years before they are finnished. The paintings also take a lot of planning and drawing. The collages are all intuitive and quickly finnished, just kind of shooting from the hip. I love the randomness that hapens working with collage, the surprises and accidents. I bought a 1949 Sears catologe off Ebay and have been adding some of its wierdness to the process. The ladies underware section in that old catolog is a real mystery.....so much engineering must have gone into those girldles and braziers, (engineering done by men, who had no first hand experiece with what a womans body really requires for support and comfort ). We have an Etsy shop where we have been making some of our art available that is in the lower price range. These collages along with cards and drawings, pot holders and Rose's softies have been making their way around the world via Etsy. If you have some wierd paper products at home you haven't know what to do with you could either try your hand at making your own collage or you could drop some off with us and we will add it to our mix.